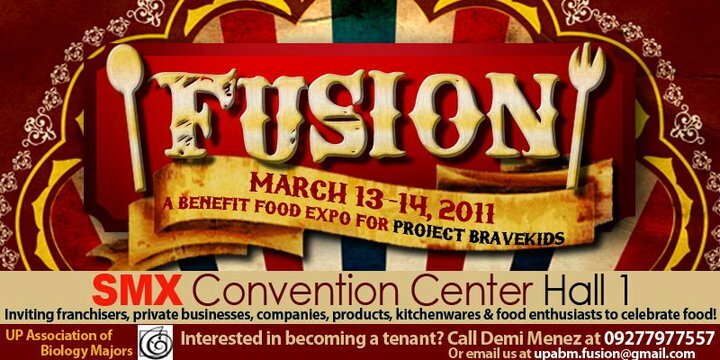 Calling on all food lovers... the University of the Philippines Association of Biology Majors brings you, FUSION: A Benefit Food Expo this coming March 13 and 14 in the SMX Convention Center. Famous restaurants, franchising companies, culinary schools and top chefs from all around the metro will be joining us to celebrate food at its best! Proceeds of this event will go to Project: Brave Kids, a non-profit organization whose mission is to improve the lives of those children with cancer. For inquiries, email upabm.fusion@gmail.com. Come join us on the 2-day food expo to help children by enjoying good food and even better company.